It's safer, so why don't plane seats face backwards? Each year, at aviation shows around the world, manufacturers unveil all manner of quirky new cabin designs and innovations. Bigger luggage bins, LED lighting and larger windows have all come to fruition, while foldaway seats and shareable armrests could be next. We’ve even seen an ambitious plan to turn unused parts of the cargo hold into some sort of relaxation area for passengers, complete with beds, play zones for kids and a bar. There is one modification that hasn’t been proposed in recent years, however. And – despite experts claiming it would make flying (or, at the very least, crashing) far safer – it probably never will be. Rear-facing seats. For more than a century, ever since the first scheduled commercial flight, passengers have – with very few exceptions – faced forwards. But when sudden deceleration occurs, such as in the event of an accident or emergency landing, rear-facing seats provide far better support for the back, neck and head. That’s why rear-facing baby car seats are now the norm. Studies have suggested that, in the event of a frontal collision at around 30mph, a rear-facing seat reduces the stress inflicted on a small child’s neck from the equivalent of 200kg to around 50kg. Occasionally the issue is raised. 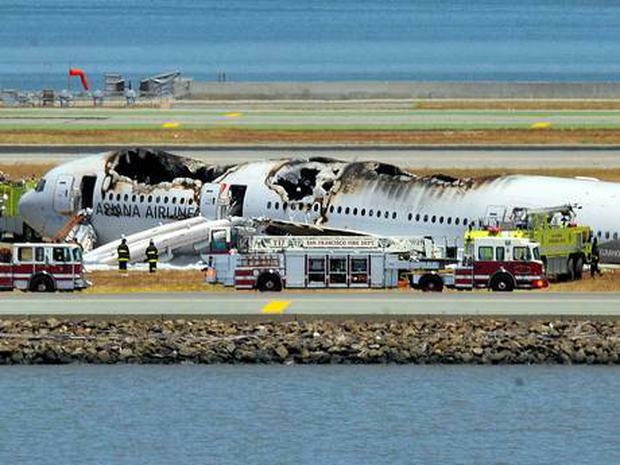 On July 6, 2013, Asiana Airlines Flight 214 crashed on its final approach to San Francisco International Airport (above). Three died and 187 were hurt, many of whom suffered spinal injuries. This prompted commentators, including doctors who treated survivors, to suggest manufacturers consider rear-facing seats and three-point seatbelts. But none gave the idea any serious thought. Dozens of new aircraft have been introduced since then – and many more are planned – all of which will stick with the standard offering. So why won’t manufacturers consider it? David Learmount, operations and safety editor at the aviation news website FlightGlobal.com – and a former RAF pilot and flight instructor – agreed that in the event of a crash rear-facing seats are safer, but said airlines would be unlikely to support such changes due to costs and customer preference. “Lots of research has been done into it and the RAF has rear-facing seats on its transport aircraft because it is proven to be safer,” he said after the San Francisco crash. He said the same issue would apply with the introduction of three-point seatbelts, as the centre of gravity would move from the waist to the shoulder. Mr Learmount also claimed that rear-facing seats would face opposition from passengers. Another proponent of changes to the industry standard is Bern Case, former director at Rogue Valley International-Medford Airport in Oregon. He campaigned for the introduction of rear-facing seats throughout the Nineties and was interviewed by Air and Space Magazine about the issue. “Airlines say passengers wouldn’t like to face backward. But military airplanes and corporate jets have them and no problems are ever reported,” he said. For nervous fliers hoping to improve the odds of survival in the unlikely event of a crash, take note: some planes do have rear-facing seats. Unfortunately, they will cost you a small fortune – they are found in business class (or on private jets). Premium cabins on BA, American Airlines, Etihad and United sometimes feature seats that face in both directions. And tales of motion sickness appear few and far between. They might be safer, but that’s not why airlines have them. It’s about saving space, of course. This was the motivation too when Zodiac Aerospace – an aircraft interiors firm – patented a new seating plan in 2015 that featured a combination of rear and forward-facing seats. The design would “increase the space available at the shoulder and arm area” – eliminating the elbow wars at 35,000 feet – but would have forced passengers to (horror of horrors) make eye contact. It never saw the light of day. Aircraft of the past had them in economy class. The Hawker Siddeley Trident, used by BEA in the Sixties, had a particularly curious configuration – half the plane facing one way and half facing another. And for years Southwest Airlines was known for its “lounge seating” with two rows at the front of the aircraft facing one another. It was “the most sought-after, or avoided, seats on the plane”, according to employees.